Located a mile apart in the heart of Hunterdon County, the villages of Pittstown and Quakertown were both affected by the Revolutionary War. 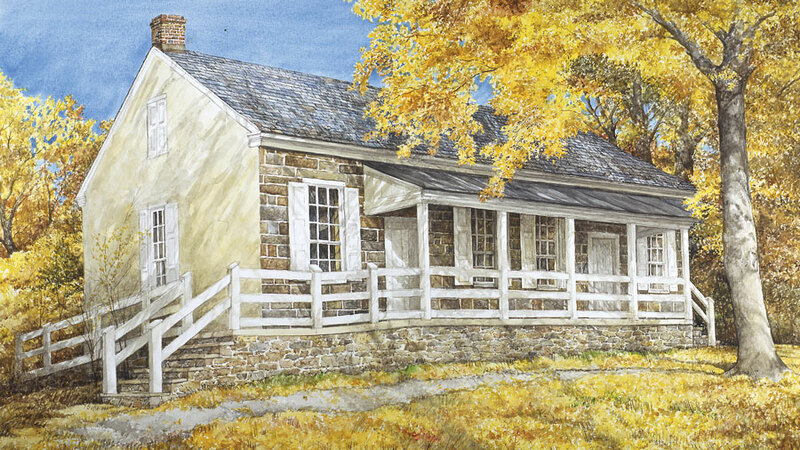 Dan Campanelli's 2006 watercolor painting, Quakertown Meeting - Inner Light, Outer Beauty, depicts the meetinghouse in it renewed splendor today. 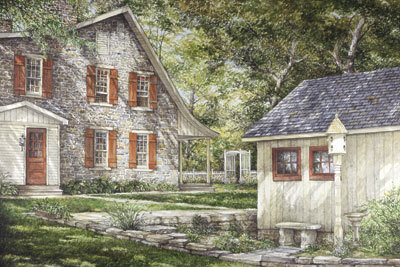 My husband, Dan, is a well-known painter of old mills, historic houses, and rural scenes in our area. One of the perks of my marriage is that I get to roam the countryside with him while he searches out locations to paint. One day in 2005, while driving through Quakertown, Hunterdon County, we spotted a 'for sale' sign and noticed a beautiful old stone house. The earliest section was built circa 1765, another in the 1790s, and the earliest part was enlarged in the 1920s. We fell in love with it on the spot, and thus began months of renovation and restoration to bring the house back to its 18th century bones. Willis W. Vail took this photo in 1925 after he enlarged the circa 1765 one-room stone cottage where his great-great grandfather, John Allen, had once lived. Allen, a Quaker, was taken to jail in Trenton by the Patriots in 1778 for refusing to sign an oath of allegiance to the State of New Jersey. 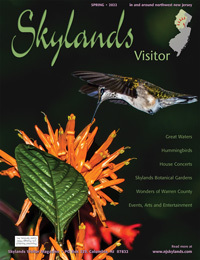 The picture appears along with hundreds of other historical photographs in Arcadia Publishing's Franklin Township, Hunterdon County. Below: Dan Campanelli painted The Shade Garden © in 2007 to commemorate the venerable old structure he and his wife have lovingly resotored. The watercolor painting has been published by the New York Graphic Society. Then we began the long journey of researching the history of our new home. The previous owner had told us an intriguing tale. He said that John Allen, the Quaker cordwainer (or tanner) and owner of our property during the Revolutionary War, was taken to jail by the British for giving boots to the American soldiers passing through the area, and that British officers stayed in Allen's home, as well as in the Quaker Meeting House in town. The second part of the story was that, later on when the Patriots occupied the area, they took John Allen to jail for not signing an oath of allegiance to the state of New Jersey. We thought, "Gosh, this guy couldn't win. First he was nice to the American troops and they later came back and jailed him! History buffs as we are, we immediately set out to confirm this tale. All the books written in the mid-to-late 1800s repeated various versions of these stories, some more embellished than others. One 1861 book stated that, "In the war of the Revolution, a party of soldiers took possession of this house (the Quaker Meeting) and defaced it. Snell's Hunterdon County, New Jersey, published in 1881, claimed that, "During the Revolution it (the Quaker Meeting House) was used and abused for a time by a detachment of British soldiers." On another page we read, "The British, it is said, were at one time encamped in the locust grove northwest of Quakertown. The officers were quartered in the house of John Allen." To find out the truth we stepped back in time to the original settlement of the area by members of the religious Society of Friends who arrived soon after 1700. They had come north from Burlington and chose the vicinity around Quakertown because of its rolling hills, fine creeks and rich soils. Quakertown sits on a high plateau filled with plentiful natural springs that create streams which empty into the Capoolong and Lockatong Creeks in the valleys. Early maps of the area indicate Hoffs (today Pittstown), but show no name for the village containing the Friends Meeting House. The first mention we found was on a "sketch of the northern parts of New Jersey, made by a British officer in 1781. He noted the two villages as "Pitt" and "Quaker". At first the Friends held meetings in their homes, until a log structure was built around 1733 in Quakertown. First it was known as Bethlehem Meeting for the name of the township that had been founded in 1730, but when Kingwood township hived off from Bethlehem in 1749, it became known as Kingwood Monthly Meeting. A stone building was erected in the mid-1700s and, in 1862, its stones were reused for the present larger structure set back further off the road. In 1750, some members who had moved up to Sussex County built a meeting house there, and for a time Monthly meetings were alternated between Kingwood (Quakertown) and Hardwick until 1797. Picture the village of Quakertown dotted with log cabins and the beginnings of commerce in the early 1700s. The men were primarily farmers, but plied their trades of tanning, carpentry, blacksmithing and more. It was a thriving business center, with a general store, hat shop, and a tavern. Yes, a tavern! Quakers were supposed to refrain from dressing flashy, drinking, lottery playing, profanity, and marrying non-Friends. But minutes of the Kingwood Meeting are filled with names of Friends who broke the rules. One particular item in 1777 notes that, "The committee on reformation report there is one Friend keeps a tavern which is under care." This meant that a group of members met with the tavern owner and let him know they were keeping an eye on him. The old burying ground behind the Meeting House is filled with early stones that are either blank or contain only initials, as was the Quaker style back in the 1700s. Later stones of those interred in the 1800s have full names inscribed and are descendants of the early Friends who first settled this picturesque plateau: Clifton, Robeson, Hampton, Rockhill, Emley, Willson, Large, King, Johnston, Stevenson, Allen, Laing, Wolverton and Vail. In 1764 the Friends opened another cemetery a short distance away to serve as a burial ground for non-Quakers. Some of the same family names can be found in this graveyard as well. 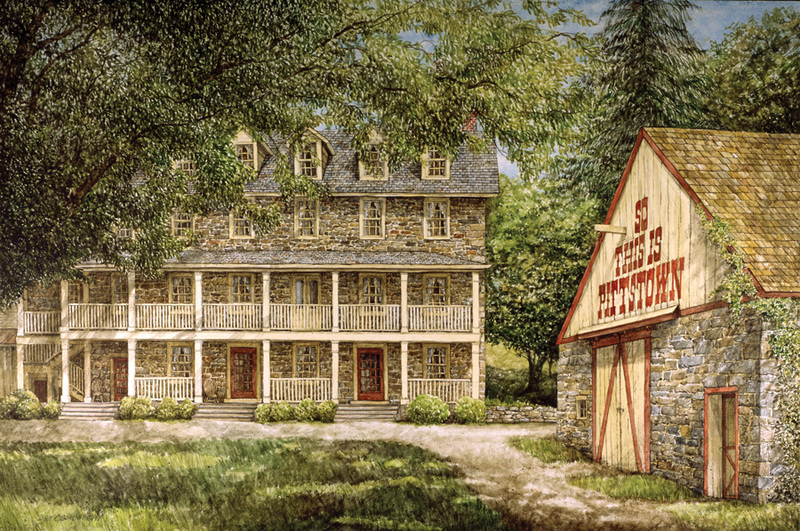 Dan Campanelli's painting depicts Pittstown from years past. This scene is familiar to those who frequent County Route 513 where it meets CR 579. While Quakertown was growing, so was Pittstown, located a mile or so downhill in a valley bisected by the Capoolong Creek and its' tributaries, perfect waterways to be used as mill streams. Edward Rockhill, a prominent early Quaker, built his homestead in Pittstown around 1731, a gristmill in the 1740s and began practicing medicine there in 1743. Then Charles Hoff, a non-Quaker, bought much of the land that is now Pittstown and built a mill, an iron forge, and ran a general store. In 1764, Moore Furman, of Trenton, purchased the property known then as Hoff's Mills, and is said to have renamed it Pittstown. Furman established a nail factory, distillery, flour mills, general store, a hotel and dwelling houses. The hotel, or tavern, may have been built upon an original structure belonging to Charles Hoff, and was enlarged by Furman in 1800. It still stands today but has withstood a huge fire in 1913, and undergone many changes and additions. By 1740, tiny, one-room stone or clapboard cottages with sleeping lofts began to replace the area's log cabins, and in 1764 Charles Hoff sold property he owned on the outskirts of Quakertown to his sister Phebe and her husband, Benjamin Coddington. The Coddingtons erected one of those early stone cottages, but did not stay long, as the property then transferred to a Quaker, Peter Potter, in 1772. Potter, who had established a tanning business along the stream that runs through the farmland, made the serious mistake of marrying 'out of unity' and he was dismissed from the Meeting. In 1776 Potter and his wife Mary moved away, selling the house and business to a young man from Shrewsbury, Monmouth County, our John Allen. It is unclear whether Allen was a Quaker before moving here, but he quickly joined the Friends Meeting. We suspect it was because he was smitten with Mary Large, a local Quaker girl who lived a short distance away from his new homestead and tannery. Meanwhile, the Revolutionary War was in full swing. Moore Furman became deputy quartermaster general of provisions for George Washington's army, and Pittstown became a base of activities for the troops. The village's citizens and military personnel were actively working to gather men, food, horses and other provisions for the Continental army. Due to their pacifist beliefs, the members of the Religious Society of Friends who inhabited the nearby village of Quakertown did not participate in the War, but some did allow provisions to be stored and hidden on their properties. In 1778 Moore Furman built a mill in Pittstown specifically for military use, and grain was ground to feed soldiers camped at Jockey Hollow and other New Jersey encampments. In our search to find out if the British had occupied Quakertown during the War, friends of ours found a Revolutionary War pension claim made by Jacob Gearhart in 1832. Gearhart stated that, "In the Spring of the year 1777 (he) volunteered as a private in the Company commanded by Captain Jacob Gearhart (his father) at Kingwood Township, Hunterdon County, New Jersey-and was immediately appointed orderly Sergeant of the Company-the Company was first marched to Pittstown to guard the Continental stores there. Had a guard house between Pittstown and Quakertown. Continued in the service keeping guard in the spring of the year 1777 till August Seventeen hundred and seventy nine. We guarded Quakertown as well as Pittstown...was employed in guarding Continental stores at different times in Pittstown, Quakertown, Jugtown and other places and in arresting Tories and taking them before the Governor." Young Jacob Gearhart was about fourteen when he joined the company commanded by his father. The elder Gearhart had been one of the men who helped gather boats for Washington's crossing of the Delaware on Christmas day, 1776. This information seemed to confirm that no British troops occupied Quakertown or Pittstown. How could they with all those Continental troops around at the time? We recently came across an entry in a diary by a man named James Parker that puts a little twist into our argument. Parker was later discovered to be a Loyalist, and he resided on property a mile north of Pittstown. In December of 1778, some British troops stopped overnight at his home, apparently en route from New York to Virginia. According to the diary, Moore Furman was the one who informed Parker of the British activities, and we think that the Americans probably laid low and acted innocent as the troops passed through. The Continentals would have been outnumbered had they tried to attack the British. The story we were told about Quaker John Allen was that the British took him to jail in Trenton for giving boots to the American troops that had passed through before them. Another tall tale! The Americans held Trenton since the start of 1777, so how could the British imprison someone there? We searched the Quaker meeting notes for any evidence that British troops occupied their meeting house in Quakertown, but found none. What we did find was that two Friends were jailed for refusing to sign the oath of allegiance. One was Joseph Moore of Ringoes and the other, John Allen of Quakertown. The meeting notes reveal in detail that, "Our Friend, John Allen about the age of 22, for refusing to take this test to the State of N. Jersey so called and abjuring the Crown of G. Britain, was confined in Jail for some time & fined by the court £25, for which was taken 1 Cow, 1 Feather Bed, 20 pr. of Shoes, worth £19 10s. For Militia Fines, 1 Cow, 3 sides of Leather, 2 pr. of shoes, 1 pr. Boots &_Some Leather worth £8 5s. " We figure he was jailed sometime between February and May of 1778. Warrants were issued by Captain Jacob Gearhart, Moore Furman and others to arrest those who refused to sign the oath, so it is highly likely that Gearhart and his son came to John Allen's Quakertown home in order to arrest him. So there you have it! The British troops didn't occupy John Allen's (our) house, and they did not take him to jail. He was imprisoned and fined by the Patriots for upholding his religious convictions and "not complying with the unjust requisition of Men to become instruments in shedding Human Blood. He didn't give boots to the American troops. instead, they took the product of his trade, boots and shoes, as military fines. John Allen did marry his sweetheart, Mary, in July of 1778, after he came back from jail. He prospered and even added a two-story stone addition to his one-room cottage. 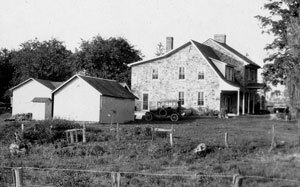 Several generations continued to live on the farmstead until 1934, and continued to be members of the Friends Meeting. The Quaker Monthly Meeting closed in 1900. The only surviving trustee of the Meeting, Willis W. Vail, a great-great-grandson of John Allen, opened the meeting house for worship once a year starting in the 1920s. By the 1960s it was active again, and remains so today. In the 1840s a Methodist Church was built in the village, and later rebuilt as a beautiful Queen Anne-style structure in 1879. It survived a major lightning strike in 1895, but unfortunately one of its' parishioners did not. 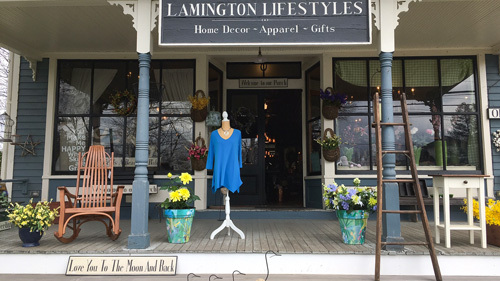 Two general stores and other commerce gave way to a handful of antiques shops in the 1970s and 80s, but today, there is hardly any commerce. Quakertown still retains its small-town charm. A walk around the village will delight your senses with a variety of architectural styles ranging from Colonial to Victorian to Craftsman, along with the villagers' well-tended gardens. The Franklin Township School, opened in 1937 in the center of Quakertown to replace five one-room schoolhouses around the township, is presently undergoing expansion. The village is surrounded by beautiful expanses of farmland. In the early days, they were devoted to crops and animals for food. Today crops such as corn, soy beans, and hay still abound, along with vegetables, strawberries, Christmas trees and flowers. Sheep, alpaca, and horses also dot the landscape. 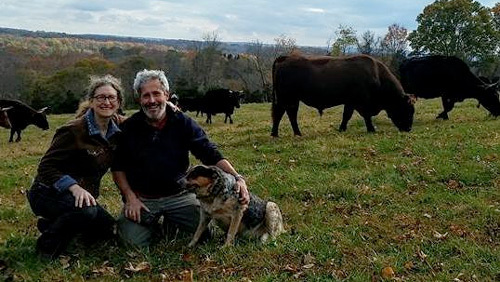 A multitude of farm stands overflow with seasonal produce, and of the township's 14,746 acres, over 3,226 have been permanently preserved for farmland or recreation. Pittstown is also still a small village at heart, although much to the residents dismay, a multi-faceted stop light now dominates the crossroads in the center of town. 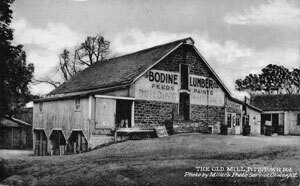 Moore Furman's mill still exists today, and houses two businesses, one a tack shop and animal feed store, the other sells swimming pool supplies. Furman's tavern, called the Century Inn in the early 1900s has gone through many metamorphosis. Presently it is known as the Pittstown Inn, and serves fine lunches and dinners in a beautifully restored stone structure. There were a few general stores up until the mid-1900s, but now Perricone's Market, established in 1988, is the place for local farmers, residents, and passers-by to catch up on the latest news or gossip of the day, while enjoying home-cooked breakfast, pizza, sandwiches and more. The center stone section of the Pittstown Mill was built in 1778 by New Jersey deputy quartermaster general of provisions, Moore Furman. The mill produced flour to feed Gen. George Washington's army encampments throughout the state. 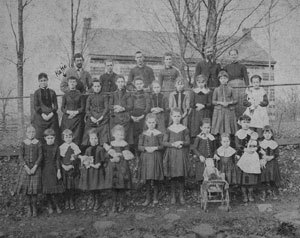 This 1888 First Day (or Sunday) school at the Freinds meeting house (behind the group) was open to all community members, regardless of their religious affiliation. 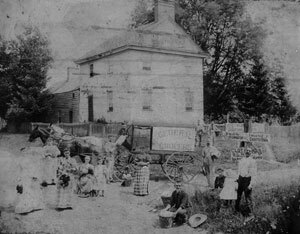 At the intersection of Allens Corner, Croton, and Franklin School roads, people proudly posed for the camera with their newly acquired items around 1890 when the traveling grocery wagon came to town. A walk through these two villages steeped in history, and listed on the State and National Registers of Historic Places will reveal only a portion of the township's 183 frame houses built before 1900 and only a handful of the area's 99 Colonial-era stone structures. You can find more if you drive along the townships scenic roads, along with miles of beautiful farm fields, ponds and streams. Slow down and enjoy the scenery, and please be mindful of the farm vehicles you may encounter. They represent our historical past and our agricultural future. You can easily see the beauty that brought us to the area, and it is our hope that residents today will help fight to keep the township rural, and thus continue to become part of its history.